Developing countries are particularly vulnerable to the effects of climate variability and climate change. These countries are often located in regions with high climate variability and are highly exposed to climate extremes, such as droughts or floods. Such extreme weather events hinder economic and social development and cause high numbers of casualties. Economic losses from these disasters have also been increasing rapidly over the past decades. In some cases, disasters have set back development by several years or percentage points of gross domestic product (GDP). Climate change is likely to exacerbate these losses. A recent study found that unmitigated climate change could lower average global incomes by 23% by the year 2100 and widen global income inequality (Burke et al., 2015). This paper* aims to inform further research in Year 2 of the BRACED programme by providing a high-level overview of the context and structure of the financial services sector in three BRACED countries – namely, Ethiopia, Mali and Myanmar. Presented in this paper are a small number of initiatives and financial products currently used in the three countries to address vulnerability to climate extremes, with an evaluation of their effectiveness in addressing the identified needs and potential for replication in other country contexts. *download the full working paper via the link provided under further resources. A brief outline of the methodology and the key recommendations (abridged) are provided below. See the full text for much more detail. The findings in this paper are based on engagement with a range of stakeholders in the countries of interest, as well as a desk-based literature review. During the course of the study, we spoke to 16 stakeholders across the three countries, covering financial services providers, non-governmental organisations (NGOs) and academics. Appendix 1 of the working paper provides a full list of stakeholders and Appendix 2 the semi-structured interview questions. We have supplemented these ‘on-the-ground’ insights with published literature and datasets, to reflect international best practice and approaches. We present these as a series of case studies. Saving and borrowing help people adapt to changes and cope with shocks (contributing to the absorptive and adaptive capacities elements of the 3As approach), but are not always accessible for the most vulnerable populations. The abridged recommendations below seek to address this issue - see the full paper for more detail and examples. It is important to note that to cope with large shocks that affect many people, savings or borrowing may not be adequate. A number of recent initiatives have focused on the design of index-based weather insurance to increase financial inclusion among farmers, focusing on drought risk (Hartell and Skees, 2009). When partnered with early warning systems or when it is structured in such a way as to provide compensation in advance of the disaster, this can provide protection against large shocks and contribute to building anticipatory capability through preparedness and planning. However, it is important to recognise that, in some cases, insurance may reduce adaptive capacity. For example, if a farmer has limited disposable income and is persuaded to buy into a drought risk policy, then they may have used what little spare income they had. In the eventuality there is no drought, the premium paid was an opportunity cost. If there is another form of extreme event (e.g. flood, pest, disease), then the farmer paying the drought premium will have less adaptive capacity than their neighbour who saved the money and could afford to buy food. Removing regulatory and legal barriers that may hinder the growth of the financial services sector, while improving the investment risk profile and the attractiveness of the country to private sector investment in the financial services sector. Reducing costs and improving trust in the banking system (including payment and security settlement systems and public credit registries). Improving physical access for the most vulnerable (rural inhabitants, dependent on agriculture and natural resources for their livelihood) to financial instruments by using the postal network, and improving infrastructure to host financial agents and facilitate transport (roads and public transit). Enhancing competition, protection and flexibility. Governments can help keep service costs low by ensuring fair competition and consumer protection, or by requiring the introduction of low-cost bank accounts for vulnerable populations. Governments, with the support of international development partners and donors, should engage with domestic financial services providers. This would enable the market to expand and be scaled up at an affordable cost and provide products that promote a risk management ethic, while also building the climate resilience of the most vulnerable population. In particular, weather index or micro-insurance schemes supported with early warning systems or structured in such a way as to provide compensation in advance of the disaster should be expanded. There is much to be learnt from the experience accumulated under the R4 Rural Resilience and IBLI schemes in Ethiopia and other best practice country initiatives. 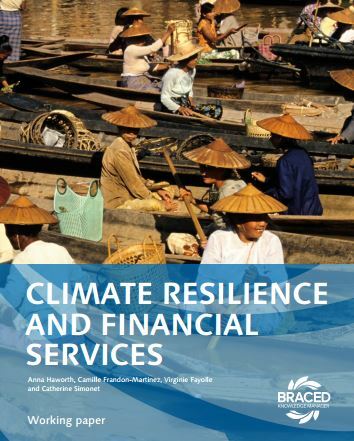 It is important to exploit the unique competences the private sector can contribute in building climate resilience through the development of new goods and services in the financial and information and communication technology sectors. For instance, in the mobile banking sector, further research is needed to develop applications tailored to specific users’ needs, and investments are needed to expand mobile/telecoms network coverage. There is also a crucial need to consider religious, gender and cultural considerations when developing financial products, as demonstrated in Ethiopia with Sharia-compliant products for pastoralists in predominantly Islamic areas. Governments, NGOs and service providers have a role to play in addressing low levels of financial literacy and limited experience of financial services among vulnerable groups. Many people in rural communities save and make financial transactions in cash. They are more likely to use family networks and friends to borrow from rather than financial institutions. They also may have no or limited familiarity with buying insurance products. These factors limit the ability to build up their assets, establish or further develop a business, increase their wealth and access funds in an emergency situation. It is therefore recommended that governments, working with NGOs and nascent financial sector service companies, collaborate to build the capacity, financial literacy and trust of vulnerable and disadvantaged groups. This could include training on disaster risk reduction and preparedness and business skills (e.g. how to start a business, taking on employees, etc.). They should bear in mind social and gender considerations, as well as working with religious communities to explore ways in which financial services can be developed that are consistent with religious beliefs and values. It is important not to ‘reinvent the wheel’ and focus should be placed on building on and scaling up existing initiatives led by socially oriented MFIs and the Saving for Change programme carried out by CARE, Plan International and World Vision. This research was produced by Acclimatise Group Limited. The task was led by Virginie Fayolle, Senior Economist at Acclimatise. The Acclimatise team also included Anna Haworth, Risk Advisor and Camille Frandon-Martinez, Researcher.